Jack Sheppard’s Concert Party on the Marine Parade provided amusing entertainment to the inhabitants and visitors alike. However, in spite of quite regular attendance I have only one specific recollection of a performance when a man in drag and possibly on stilts sang a popular song of the 1930s titled ‘Have a nice cup of tea in the morning and a nice cup of tea at night’. Of course the song must have contained a few more words than I can remember. The entertainment was for adults rather than children but I do recollect that the performance contained a chorus, dancing girls, a singer and a comedian. The male cast usually wore boaters and striped blazers. Also I recollect the relatively small stage which was graced by a piano but there were no other props. Behind the stage curtain there was a small extension which served as changing rooms. It was I suppose all rather amateurish but it did provide cheap and, more often than not, very enjoyable entertainment. Jack Sheppard in his capacity as impresario, certainly provided an opportunity for budding aspirants to the music hall of those times. In fact possibly Jack’s greatest claim to fame is that he gave a certain Brighton boy, Thomas Henry Sargent, better known by the stage name Max Miller – the Cheeky Chappie, his first start in show business. 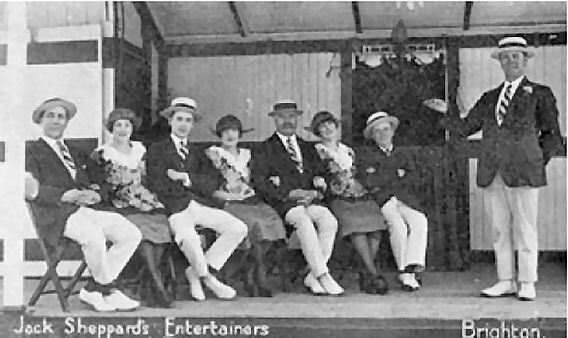 Jack Sheppard’s shows were enacted on Madeira Drive. west of the Banjo Groyne, opposite The Lift, not on Marine Parade. In inclement weather it was performed in a room adjoining to The Lift.